Linda you have made a really positive start to this new course with a rich body of work. 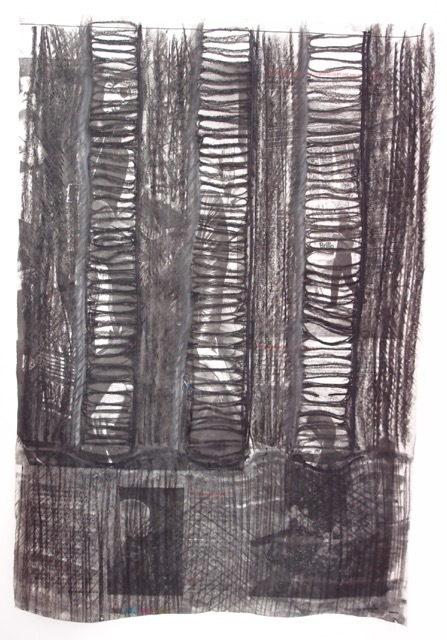 It demonstrates your skill in drawing and an ability to use mark making to explore texture, composition and form. You have done some very interesting and relevant research during this assignment and used it appropriately to inspire your own creativity. The written work in your learning log is articulate and reflective. This is really reassuring to read. It was a big decision to change to the new course but this makes me feel that I am approaching it in the right way. I am very much enjoying the tasks and the way they are delivered, I think that I have felt more confident about my work and this has shown in my drawings. 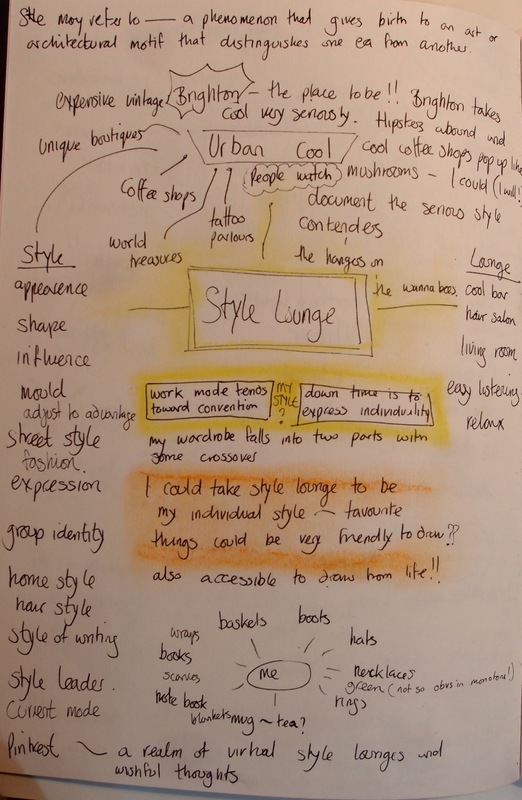 For this first assignment in A Textiles Vocabulary you have used the Style Lounge theme to develop a group of drawings. You started this work really positively by creating mind maps of the different themes, organising your ideas so you could make a choice of which to use. I like how you made Lounge Style personal, understanding that through this you would get more from the exercise. 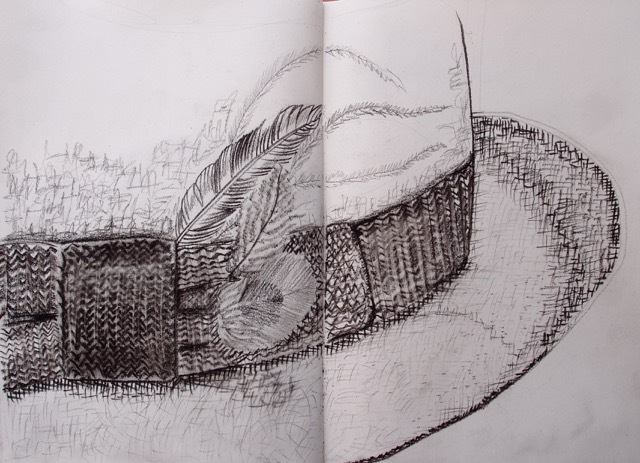 Your initial drawing is nicely executed, then successfully going onto explore the items further in a range of mediums and on different surfaces. This way of drawing and redrawing in different ways is an excellent process to go through. It helps you to see what is there and focus on what excites you. I particularly like they way you have done this with the necklace you drew – exploring the felt beads each with a different medium. This has given you a range of results in one place, presenting you with the opportunity to compare and analyse the effect produced by each medium. I also like the group of drawings of the cup, using print techniques to create surface texture, tone and imagery. They have a nice loose exploratory style with an understanding of placement and composition. I am pleased to see that you have included the plastic print surface you used. These items are often very interesting and have a unique value that should be appreciated. For me your strongest work is where you have used the sole of your shoe to create surface texture and meaning. 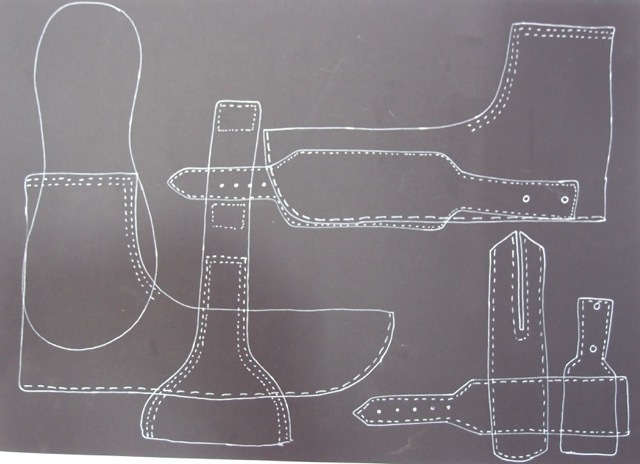 There is evidence here that you have also problem solved by transferring the texture of the sole to a printing foam in order to achieve more definition in the print. 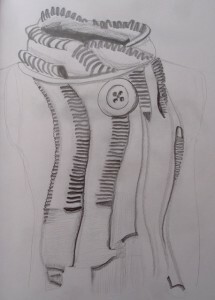 The drawing that is most successful is where you have used added the chevron print and collage. 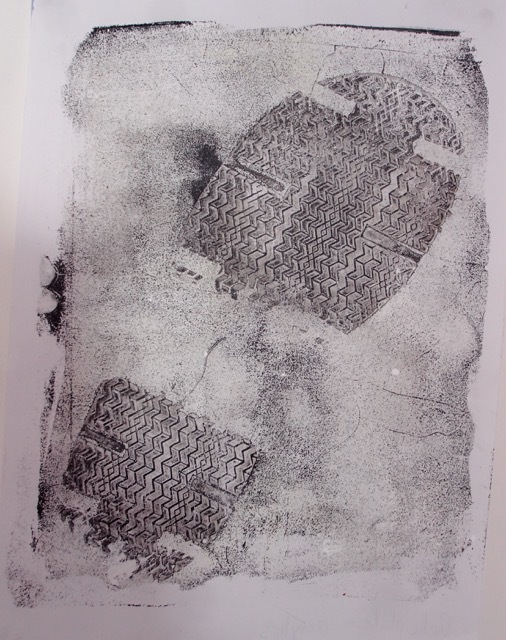 There is a balance to the composition with the positive and negative shoe prints and the enlarged chevron shape in both 2 and 3 dimensions. 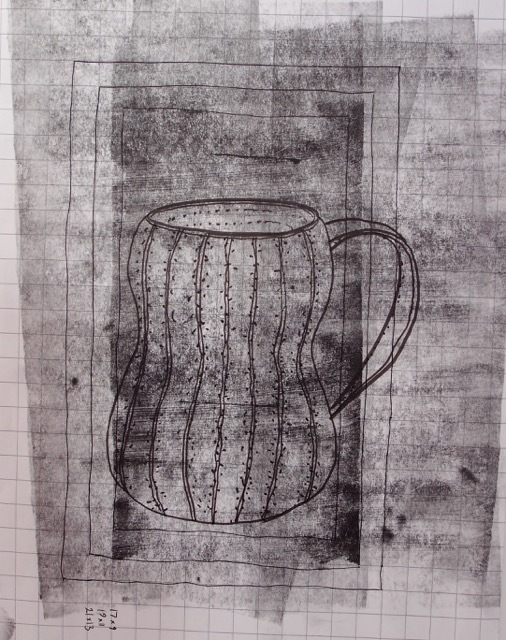 I was really excited about my cup drawings – interestingly they were also some of the quickest drawings that I produced so I’m really pleased that they were highlighted, I am beginning to realise that ‘drawing’ is so much more than trying to create an exact image and I must try to keep this in mind. I wasn’t so confident about the shoe prints so this gives me the courage to experiment with ways of working, I do like adding 3D elements, the drawing with added print was a playful process. I now have license to play more!! I suggest you continue to use drawing to explore the visual world using a range of techniques and media. This will ensure you continue to build your skill base and the development of your own style. You have made a good start to your learning log and well done for choosing an online platform. You have included some interesting research material and responded to it well. The research you collected whist in France is particularly interesting. 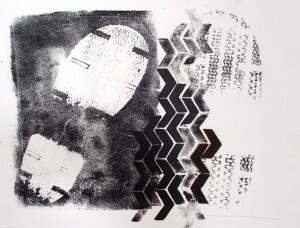 I can see how you have made links with your own work in the responses you have made. This is excellent. I suggest that you continue to respond to the work of others you have seen and enjoy. This will help you to develop your own style and understanding of what you want to see in your own outcomes. You have included a good number of photographs from this exhibition and added your own analysis of the work. I am loving that my creative net is widening, and I’m trying to capture the tenuous links that I am making in my mind. Whilst wandering around I’m starting to have marvellous thoughts! It is clear to me that research isn’t research unless it is recorded so it is a priority for me to make more of an effort to record my findings and thinkings in a variety of ways. You have included in your learning log a reflective commentary of your own work. This is articulate and revealing of how you think and understand your own creative process. It would be nice to see more of the photographs you describe in your learning log. 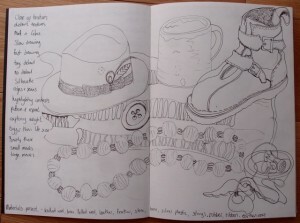 There is some interesting writing about how you worked through putting together your still life. Changing it to create something useful and pleasing. It would be helpful to see the process you went through including the arrangements you discarded. This not only helps the assessors see what you have learnt but also makes it clear to you why some compositions work and others don’t. This is my stumbling block- recording things. My tech capability doesn’t yet keep up with me. Practice, practice, practice…. Your learning log at present is a little difficult to navigate and may become more so as you add more work. I suggest divide the work into assignments and label accordingly. This will ensure that the assessors and myself will find each assignment quickly and simply. I have struggled to set up the blog and have not yet developed a good working practice. I think at the moment my blog is a real bare bones sort of document. I have planned to make it future proof by not setting it up on the free wordpress site. Theoretically this will enable me to have more space for photos etc. I hope to make a clearer structure and also add links to my flikr and pintrest sites. I suggest you continue to include research material from a wide range of places including exhibitions. Writing about what you see and what this means to you. Add more imagery of your own work to include the processes you go through in order to reveal your creative pathway to both your self and oca staff. Continue to reflect on what you make and what you think about it. I suggest you continue to use the recommended and further reading lists, along with the lists of journals and useful websites to expand your research. Documenting what you find in your learning log. Maintain you excellent working practices. 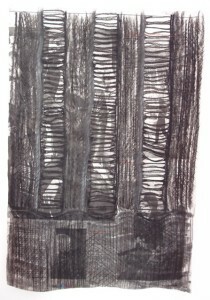 Draw regularly in a range of mediums. Organise your learning log a little better to enhance navigation. Continue to research widely responding to what you see in your learning log. Add more photographs of your work and how you work to your learning log, reflecting on the outcomes. 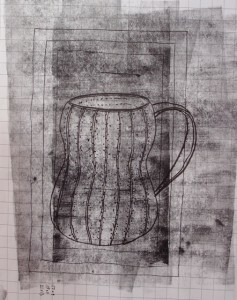 I think that my selection of objects fits the brief well, I enjoyed drawing such a wide range of textures. It was really helpful to have a focus of objects to draw. I used pencil, charcoal, printing ink, soft and oil pastels, acrylic paint, fine line pens, erasure, and various tools to scratch surfaces with. I could have carried on drawing the same objects over again with different techniques but needed to move on time wise . 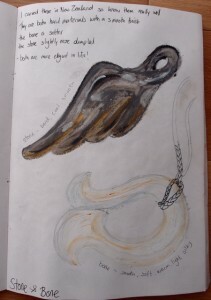 I will continue to fill this sketch book with different media and approaches. I have a long list of techniques still to try. 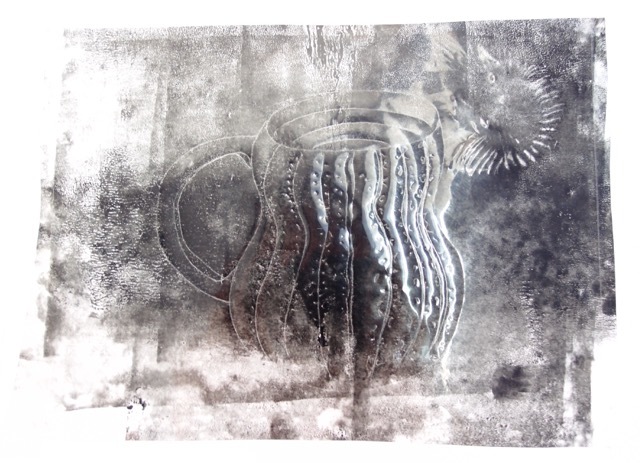 The strongest pieces of work are where I used bolder techniques, I have found I tend to want to be very accurate and record exact detail and this produces quite boring images, my favourite drawings are the scarf in charcoal on newspaper and the back drawing/mono print of my mug. I achieved some really representative marks of felt beads, it was enjoyable and effective to use a different technique for each one. I have been exploring ideas for my archive drawings and am really excited about the subject matter, I will try and be bold and experimental with my marks. I think that I approached this task with more confidence having completed assignment one of ACA. I looked at my mark making exercises for ideas of how to represent the different materials, as well as trying to think of words to describe the texture of the objects. I made some very simple outline drawings of some of my chosen objects as a warm up. I captured the shapes well, but this drawing doesnt tell me much about the textures. Using a Gelli plate as a means of getting ink on the sole of my boot and to get a resultant print from, wasn’t particularly interesting until I made a foam stamp to copy the tread pattern at a larger scale. 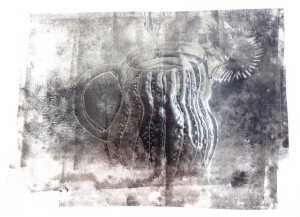 I then rolled some white acrylic paint over the gelli plate and the resulting image is a lots more textural. It reminds me of a photo I took of imprints in a muddy chalk path near the beach. I saw a shoe box with a de-constructed drawing of the shoes inside so played around with composition a little and de-constructed my boot in my mind. 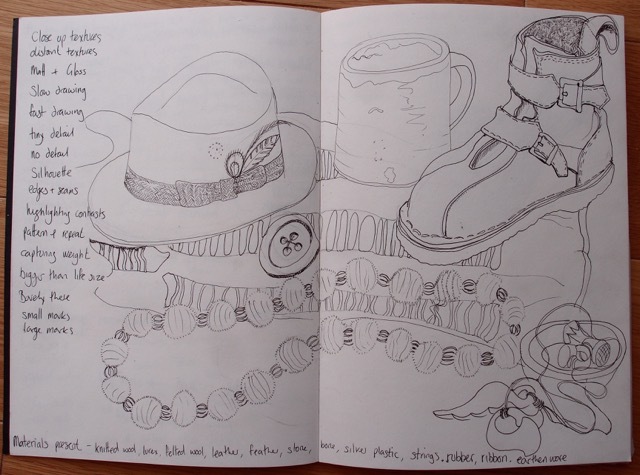 This was lots of fun – how many ways could I draw felt beads? Firm and soft, light and solid. I tried to just focus on texture so I ignored trying to capture the tones of the coloured stripes. I think that the most successful were bottom left where I used grey oil pastel and a blending stump. 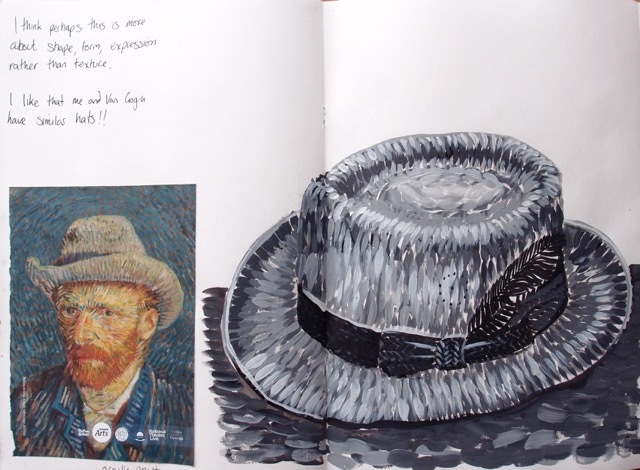 A hat like Van Gogh in acrylic paints- a good exercise in form but not really a felt like texture and the feathers are quite heavy. 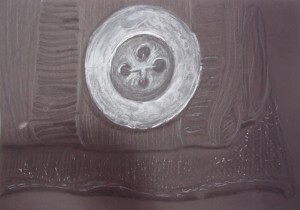 Using charcoal was a lot more successful, particularly for the ribbon texture. Charcoal and oil pastel on black paper. 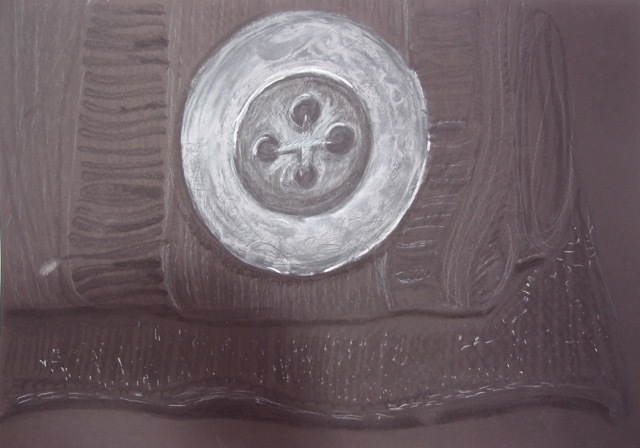 The big button is very metalic, the white pencil for metalic flecks in the yarn works really well and although difficult to see in the photo not a bad representation of knitted fabric. It’s a very calm drawing, not very dynamic. This started off as a very timid pencil drawing so I got bold with the shadows, trying to emphasise the drape. 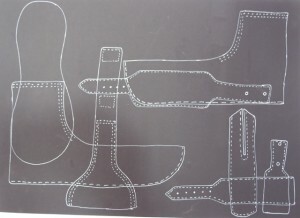 This was really difficult, textiles are much easier to represent when they are flat!!! I really like this drawing, charcoal and ink on news paper( an article about the Ramones), the wool texture is really effective and the images on the paper really emphasise the holes, it exaggerates that you can see through them, it possibly took less time to do than the other scarf pictures, or maybe I was just having more fun! Stone and bone , having carved these , I feel very attached to every mark on the surface, both hard and rigid, one cool, one warm, both as smooth as I could make them yet different to the touch. As a first drawing I captured the form well, oil pastels were perfect for the shiny surface. To me they are freedom and independent spirit, designed with care to represent that travelling time, they have more to tell, I will delve into the micro surface and work large. I was a bit overwhelmed in a gallery in Ceret, France on seeing a painting , Femme Oiseau by Joan Miro, (photos in research) on crumpled paper I shouted out loud in surprise! having seen the image in books it was altogether different seeing that it was painted on crumpled paper. 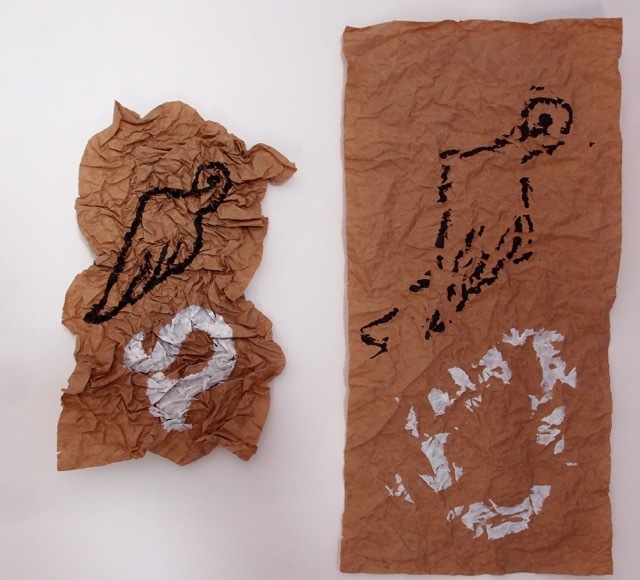 It very much reminded me of cave paintings as the paper looks very like the stone caverns in the local area that are home to ancient art. I really really wanted to unravel it. 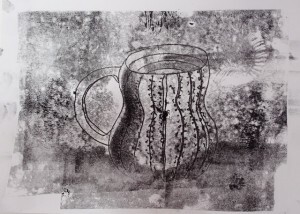 Nice cup of tea, playing with roller printing a background to draw on added some interest to a simple line drawing of one of my earthen ware mug collection. Drawing onto a piece of plastic bag, that had been inked and laid face down onto my paper gave whole extra qualities of texture with essentially the same marks. I really like this back drawing monoprintish technique, especially the crudely added shadows and dots of glaze.the bottom image shows lots of reflections, it is the plastic that I drew on and was too interesting to throw away. I will continue to revisit my chosen objects, it will be interesting to see how my observations change as I become more confident with my mark making. Observation is fundamental to art and design and is the essential starting point of the textile design and creation process. Gathering, observing and recording textiles, surfaces, materials and their unique qualities will form the basis for this project. 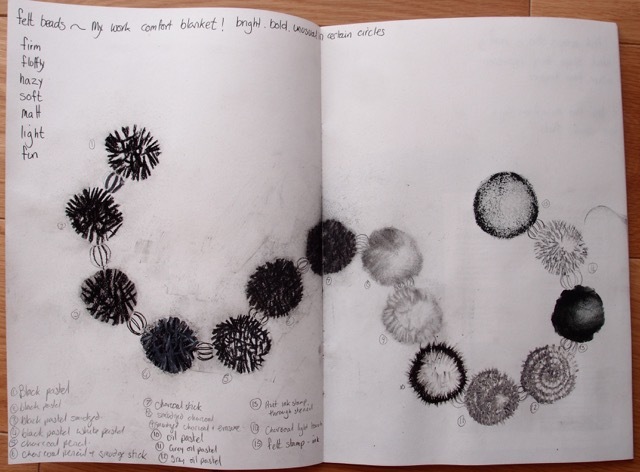 In this project you’re asked to collect, then visually observe, explore and record a group of textiles and materials. You’ll create a folio of 10 to 15 drawings that visually capture the qualities and properties of the items you select. I started this task by mind mapping all four themes, taking them fairly literally my initial thoughts on Tropical tourist and Iced landscape themes had a leaning towards the need for secondary sources of material. Natures larder was the theme that jumped out at me, however I think that I always seem to lean towards natural source materials and as the next exercise is about drawing textiles perhaps I could do with some practice with observing other textures. 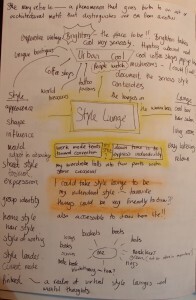 So I chose to explore “Style Lounge” more fully. Style can be used to describe the appearance a collection of artefacts or groups of people, or a time period, or it can be very subjective and about individual preferences. Easy access to objects to draw! Give a little insight into who I am. Drawing things that I know well and have a connection to. I gathered objects that I particularly like , whilst being aware of trying to give myself a variety of textures to work from. I approached photographing the objects as a magazine shoot and very quickly discovered that its no where near as easy as it looks! My first attempts were like a snap at a car boot sale, very inelegant and uninspiring! The diagonal composition looks a little more professional than my other shots, the photo tells of my love of -hand made, natural materials, walking and gathering, and the importance of a nice cup of tea! 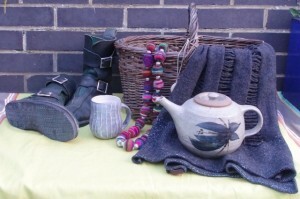 The photo was taken outside as thats where i like to be, I added the kikoy as a base layer as the paving slabs looked a bit harsh. The felt necklace is there as its my favourite winter work accessory, I’m expected to look professional so tend to have a work wardrobes, the necklace is a nod to my quirkier side (I know, I need a new job!!). It’s interesting how we wear clothes to project a particular personality or affiliation. There should be a hat in the photo, I love my hat and forgot to take it off and put it in the picture! You can’t really see the stone and bone pendants that I carved in New Zealand, I added then to give me more contrast in materials. I will have another photo shoot to try to improve the image when I have a moment. •develop your reflective skills and ability to evaluate the appropriateness of different approaches. •reflect upon your own learning experience in the context of your studies. Your tutor will be looking for evidence that you’re beginning to demonstrate these learning outcomes in your work. It’s a good idea to apply these to your progress at the end of each part of the course and reflect in your learning log on whether or not you feel you’re beginning to develop these skills. When the new level 1 textiles course materials came out I looked at Mixed media for textiles to see what I was looking forward too. I love it. The 3d experimentation and encouragement of inquisitiveness is fabulous. So I looked at the replacement course for ACA; A Textiles Vocabulary. Several things are very apparent in both courses ; a clear linear progression, clarity of tasks with a specific brief and clear aims that are not less rigorous but easier to interpret than ACA ( clearly this is my individual response, the new courses seem to be written in Linda speak!) . I like the advice boxes that are more like tutor comments in a studio environment. Really helpful reference to artists at specific points in the course. The research points are more demanding and really relevant. There seems to be more recognition of individual strengths and weaknesses and more elements of choice. They are modern and fresh and adhere to a clearer design process. I think that I am finding the process of ACA 2 counter intuitive to the way I work and teach in school and the new courses make much more sense to me. I just couldn’t resist, when I read the draft of the new OCA textiles level 1 course I knew it was for me! ….. but I was part way through assignment one of ACA, hours of work under my belt, what to do? I reread the new course notes made a list of pros and cons, chatted to some creative friends and decided to make the change. I am still following the thread, and this is where it is taking me! I have started this new blog on the recommendation of the OCA office but I will link to my first blog when relevant, and perhaps move my research across to keep it all in the same place.